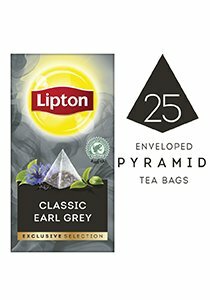 What makes Lipton Earl Grey tea unique? Quality loose tea and long tea leaves are blended with an exquisite Bergamot orange flavour. The pyramid tea bag gives the ingredients room to release all the zesty flavours of a truly refined Earl Grey. Excellent when combined with sweet desserts or thick pastries. Having a sip of tea between bites helps make every bite of your rich dessert as tasty and fulfilling as the first.